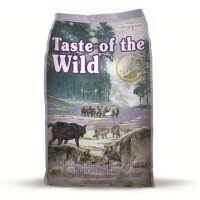 Taste of the Wild Sierra Mountain with Roasted Lamb Dog Food is a grain free diet that has been made with best quality ingredients to provide highly digestible energy for active dogs. Made with real roasted lamb and supplemented with fruits and vegetables, Taste of the Wild food mimics the natural, balanced diet your would have 'in the wild'. The delicious formula delivers natural antioxidants to help support your dog in a healthy lifestyle and is suitable for all life stages.